The director simply scores in creating stirring vignettes of Mumbai's street life. But these aren't enough to hold the film together. And that's what I call a classy consolation for an otherwise lame compilation. This one's a strange film -- a series of staccato, punctuated episodes and incidents about folk living around a traffic signal. When most other directors, want to make safe films with stars, Madhur Bhandarkar has consistently been sticking his neck out, making offbeat films on realistic subjects. 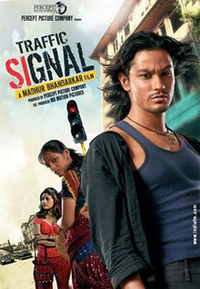 Traffic Signal is no different and takes a harsh look at the reality that is Mumbai. Silsila, a local goon, runs a particular traffic signal (where the light is delayed on purpose) where all the beggars and poor people can herd the rich cars to get money.